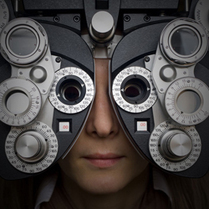 At Bethel Eyecare we take our time with you to fully examine your eyesight and eye health. 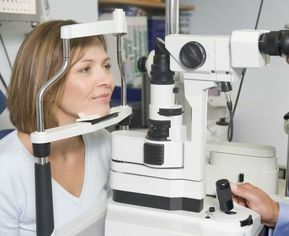 We do this because we are not only concerned about your vision, but your overall physical wellbeing. We use the following tests to determine how you eyes work together and to evaluate the overall health of the surface and inside of your eyes. The cover test is used to identify how your eyes function together. During this assessment, we are able to detect even the subtlest misalignment that could interfere with your eyes working together properly. We will observe you as you cover each of your eyes one at a time and focus on an object at distance and then repeat on a near object. While you do this, we look for how much each eye has to move when uncovered to pick up the fixation target. Performing this test allows us to get a highly magnified view of your eye to detect any signs of infection or disease that would negatively affect your eye health. During this test, we look at your eye through a high-powered lens to examine the structures of your eye (lids, cornea, iris, etc.) and the inside of your eye (retina, optic nerve, macula, etc.). We can detect a wide range of medical eye issues using the slit-lamp examination. The tonometry test measures the pressure inside the eyes to screen for glaucoma, which is vision loss due to damage to the sensitive optic nerve in the back of the eye. There are multiple ways to gauge your eye pressure; we rely on a newer and more comfortable method of non-contact tonometry commonly known as the “air puff” test. To conduct the test, an automated instrument bounces a puff of air off the cornea to measure your eye’s intraocular pressure. During this portion of your exam we will measure your eyesight to determine how well you see. We check your visual acuity, or how clearly you can see, by having you recite letters from an eye chart from 20 feet away. We use a LogMAR chart for this test, which is a more accurate measure of acuity than a traditional Snellen chart. The refraction test is used to determine your eyeglass or contact lens prescription. In order to decide your prescription, we perform both automated and regular (subjective) refraction tests. Although it is not necessary to do both types of tests, we believe it is best so that we can have the most complete understanding of your eye health and vision correction needs. For these tests, we use a device called an autorefractor to get a precise reading of how your retina focuses and take the time to personally evaluate your vision using a phoropter while asking your preference between a series of lens comparisons.